Things have conspired against us bringing you this report, but we were determined, so here it is. The week did not start well when, prior to entering the water for our first dive, our video housing flooded during testing in the pool. Fortunately, we managed to keep the video camera dry and avoided a major disaster, but the housing is in Indianapolis for repairs. If we're really lucky we'll have it back before the end of next week. Ed. note: It turned out that the camera got wet after all, and Sony was nowhere near as efficient and prompt as Ikelite in making repairs. Later, we located a scanner and added some images. It took just our first dive to regret the lack of exercise over the Canadian winter. Usually, a couple of months before we leave for Hawaii, we at least start taking extended walks. This year, for a number of reasons, the only "exercise" we got was surfing... the Net! We were aching after our first dive on Sunday, so on Monday, we stuck with one. Still, the two we did Tuesday almost did us in. Backache was a constant companion and we agreed that the ocean is not kind to almost-50 year-olds who aren’t smart enough to prepare themselves for meeting her. Meanwhile, diving and observation through binoculars suggest that something strange is up. We have completed only ten dives as we post this, so it is too early to conclude anything, but so far this has not been an ordinary summer in any way. Every summer for years, our first few dives are like taking roll call. The turtles show and line up like piano keys. We see the same regulars--the same faces--reliably each year. That isn’t happening this summer. We see lots of turtles, but many are strangers, and we don’t understand why. Another totally baffling thing is the turtles have begun dividing their time between two areas: the Turtle House, their traditional site since 1989, and an area we call Turtle House 2, or T2. It's south of the original Turtle House and in previous summers, we normally saw only two or three turtles there. Only once did we see more. It was late in the day, near sunset, leading us to speculate that perhaps the turtles bedded down there. Now in 1997, T2 is routinely attracting as many as 6-9 turtles, and on some days has showed more action than the Turtle House. Why? Why so many new faces? Where are the old standbys? Aikane, Goofyfoot, Raphael, Hilu, Hoahele--the boisterous confident honu who were always simply there? Certainly Goofyfoot and Hilu are newly emerged males and could be at the French Frigate Shoals. Aikane might be too, given her/his tail size and girth last year. We can only guess, and one thing we have learned: it is not productive to second guess honu. Tamu, a splendidly beautiful turtle, who all evidence suggests is turning into a male, now shows small ocular tumors. We sighted Tamu on our first dive. Of all the Honokowai turtles, Zeus is the largest. In fact, he is the largest and probably the oldest turtle we’ve ever laid eyes on. Records show Zeus has been a Honokowai resident since 1992. This summer confirms Zeus now is victim of fibropapillomas. There is an unmistakeable tumor in his left eye. Finally, Polzbarney, a juvenile living in Honokowai shallows for three summers now, also developed eye tumors in the ten months since we saw him last. So we have three Honokowai turtles who, in the course of ten months, are now on the fibropapilloma list. Great way to begin the summer. "Yep. Was was/is up there. Nesting away on East Is. (as most good Hawaiian turtles do). She was seen there by my people in June. Our monitoring period is over so no one up there now (left to the peace of the turtles, seals and birds)." "there is a nice fresh 'J329,' hilited with white paint, on the right posterior part of carapace. Maybe she'll return before you leave." She didn't return before we left, but we sighted Tutu this week. We couldn't see any lettering. It's been ten months, so it has likely worn off. We managed to get some photos but alas, it's not clear when we'll be able to present them to you. The good news is that Tutu remains free from the tumors she had back in the early years, and can still be regarded as one of our few regression cases. On our late afternoon seventh dive, while photographing Zeus, we noticed a large tagged female resting on a ledge. By moving slowly and scarcely breathing, we were successful in reading her tag: F 765, McTaggert. We didn't see her last year and assumed she was nesting at the FFS. To date this still hasn’t been confirmed. Wherever McTaggert was last summer, she has been at Honokowai since 1992, and is here again this summer--another familiar face. Limu is a juvenile who showed only a coarseness in her eyes in 1995, and developed eye tumors last year. She was back at her favourite spot on July 2nd. As is Limu’s way, she ignored our approach, making photographing her eye tumors difficult since her eyes were closed in snooze-mode! It says a lot about dealing with fibropapilloma when you look into a turtle’s eyes and are grateful that the tumors aren’t that much worse than the year before. This is true for Limu. Neither eye tumor is much worse, and for that we are grateful. If we'd let her, she would have taken a test bite out of each of our noses! During one of our dives, we were approached--maybe assaulted is a better word--by a tiny juvenile. This little turtle swam right up to us and began nibbling on various parts of our equipment. If we'd let her, she would have taken a test bite out of each of our noses! While this behaviour was cute and endearing, it also told us something disturbing. 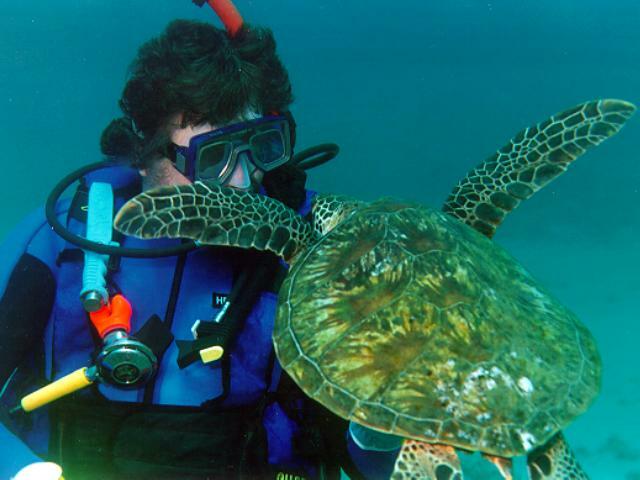 This turtle is used to being fed by divers. Really young turtles are always curious, but only turtles that are used to being fed will go so far as to nibble on you. The Turtle House is not far north of a prime dive site called Old Airport, and we have no doubt that divers there have been feeding this animal. This is really a tragedy. Yes, it is fun and exciting to get a cute young turtle flapping in your face, but it won't be so cute when she is bigger and her powerful beak clamps down when you don't expect it. Feeding sea turtles is against the law in the United States, but even if it weren't, we're convinced that it is bad for the turtles. The food most commonly fed to turtles is also used for bait. The people feeding the turtles should stop and think about what will happen if the turtle goes after someone's bait. Hooks and fishing line are not healthy for sea turtles. We believe strongly that if you love the turtles, you don't feed them!